زیاری, حسن, کی منش, محمود رضا, کیانفر, کیوان. (1397). قابلیت رادار نفوذی زمین در شناخت خرابی ناشی از رطوبت در لایه های مخلوط آسفالتی. پژوهشنامه حمل و نقل, 15(2), 1-14. حسن زیاری; محمود رضا کی منش; کیوان کیانفر. "قابلیت رادار نفوذی زمین در شناخت خرابی ناشی از رطوبت در لایه های مخلوط آسفالتی". پژوهشنامه حمل و نقل, 15, 2, 1397, 1-14. زیاری, حسن, کی منش, محمود رضا, کیانفر, کیوان. (1397). 'قابلیت رادار نفوذی زمین در شناخت خرابی ناشی از رطوبت در لایه های مخلوط آسفالتی', پژوهشنامه حمل و نقل, 15(2), pp. 1-14. زیاری, حسن, کی منش, محمود رضا, کیانفر, کیوان. قابلیت رادار نفوذی زمین در شناخت خرابی ناشی از رطوبت در لایه های مخلوط آسفالتی. 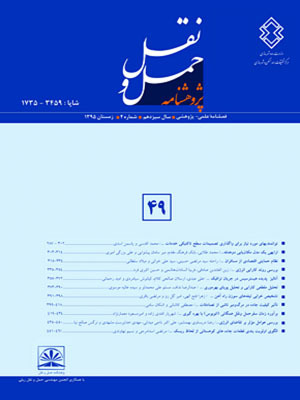 پژوهشنامه حمل و نقل, 1397; 15(2): 1-14. 1Professor, School of Civil Engineering, Iran University of Science and Technology, Tehran, Iran. Stripping is one of the asphalt surface distresses that is caused by moisture or by moisture have been intensifying. Stripping cause other distresses damage such a structural cracking and fatigue. Most common methods is coring and destructive test. The ratio of indirect tensile stress saturated to dry is one of them. But these tests are destructive and it takes time and money .In addition that test is suitable for points you core in asphalt surface and we can’t evaluate this method for widespread paving. Nowadays Ground penetration radar it helps pavement engineering to evaluate continuous and non-destructive test. In this research we have compared dried and conditioned of Bulk Specific Gravity test with TSR .we found Related between ITS and Bulk Specific Gravity with diagrams then, we compare the result of GPR surveys dielectric with destructive test .It has significantly related between The ratio of indirect tensile stress saturated to dry and bulk gravity and dielectric constant .when moisture damage occur, air void percentage goes up and dielectric constant decrease. زیـاری، ح.، دیوانـدری، ح.، کیـانفر، ک.، )" ،(1394ارتبـاط درصد فضای خالی بـا عریـان شـدگی در عمـق مخلـوطهـای آسفالتی"، هفتمین همایش قیروآسفالت ایران. - عــامری، م.، جراحــی، الــف.، صــادقی آواز، م.، )،(1394 "تخمین بصری میزان عریان شدگی مخلوط آسفالتی با اسـتفاده از روش پردازش تصویر"، مجله علمی پژوهشی زیر ساختهای حمل و نقل، شماره اول، بهار. - عبدی، ع.، کاووسی، الف.، )"،(1383بررسی پدیـده عریـان شدگی مصـالح سـنگی در مخلـوط هـای آ سـفالتی"، دومـین همایش رقی و آسفالت. -Kandhal, P.S., N.A.P. Association, and N.C.f.A. (1992), “Technology, "Moisture susceptibility of HMA mixes: identification of problem and recommended solutions", National Asphalt Pavement. -Christina Plati, Andreas Loizos., (2013), "Estimation of in-situ density and moisture content in HMA pavements based on GPR trace reflection amplitude using different frequencies",Journal of Applied Geophysics, pp. 3–10. Asphalt, Final Report”, ARA Project No.16355. 14 Department of Civil Engineering University of Minnesota 500. -Kyle Hoegh, et.al, (2015), "Evaluating asphalt concrete air void variation via GPR antenna array data “Case Studies in Nondestructive Testing and Evaluation 3, pp. 27–33. -Reynolds, J.M., (2011), “An Introduction to Applied and Environmental Geophysics”, 2nd Edition: John Wiley. -Dar-Hao Chen, et.al, (2014), " Estimating the hotmix asphalt air voids from ground penetrating radar “NDT&EInternational68, pp.120–127.